Hello, everyone, my name is Colin Schneider. I have been a member of the CFZ for nearly 5 years. I'm the host of a live digital radio show called the Crypto-Kid every Monday night at 8 pm EST. Jon was kind enough to give me access to the CFZ blog to put up announcements for my show. 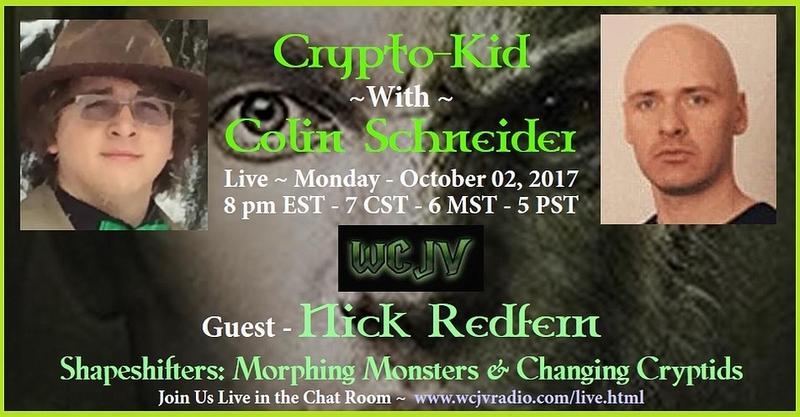 So, tonight on the Crypto-Kid, I will be joined by Nick Redfern, author of over 30 books on cryptozoology and the unusual to talk about his newest book Shapeshifters: Morphing Monsters and Changing Cryptids. This is going to be a great episode! A new study led by University of Adelaide researcher Jeremy Austin traces the history of Tasmanian tiger (thylacine) populations over the last 30,000 ..
Discovering Bigfoot Trailer: Is the Sasquatch Real? "Kane Brown summed up his feelings with four simple words".... They don't however give us the four little words. The next four words in the article are "Find us on Instagram." Oh dear.